We often hear too much of anything is bad, as it can harm our mental, physical, and emotional well-being. This phrase not only applies to material possessions, but also to what our body consumes on a day-to-day basis, from what we eat to what we drink. While we tend to drink the most water when we are thirsty, the most caffeine when we’re fatigued, and the most alcohol when we’re drunk, guzzling too much of these popular drinks can actually kill us. Compound Interest outlines just how much water, caffeine, and alcohol it takes in a single sitting to kill us, using the “median lethal dose,” (LD50) method. The toxicities of differing chemicals are based on the amount of a chemical required to cause death in 50 percent of the animals it has been tested on. When the chemical is administered orally, like water, caffeine, and alcohol, the lab results are converted into figures for humans, and expressed in milligrams per kilogram of body weight. While the LD50 of each chemical is the dose required to kill 50 percent of the test subjects, it does not guarantee death, as it may take more than the lethal dose or less of the lethal dose to die. This is all contingent on the person’s physical and medical condition. 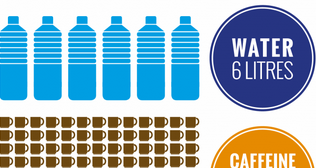 So how much water, coffee, and alcohol can kill us? Drinking 6 liters of water can lead to hyponatremia, or the dilution of the blood caused by drinking too much water, which means there is insufficient salt in the bloodstream. Consuming 188 coffees, or 175 shots of expresso can actually put us asleep forever. However, since a single cup of coffee contains about 250 milliliters of water, you will most likely die of water poisoning first. Lastly, downing 13 shots of alcohol, or .27 percent beverage alcohol content, is not only a bad idea, it will most likely lead to death. 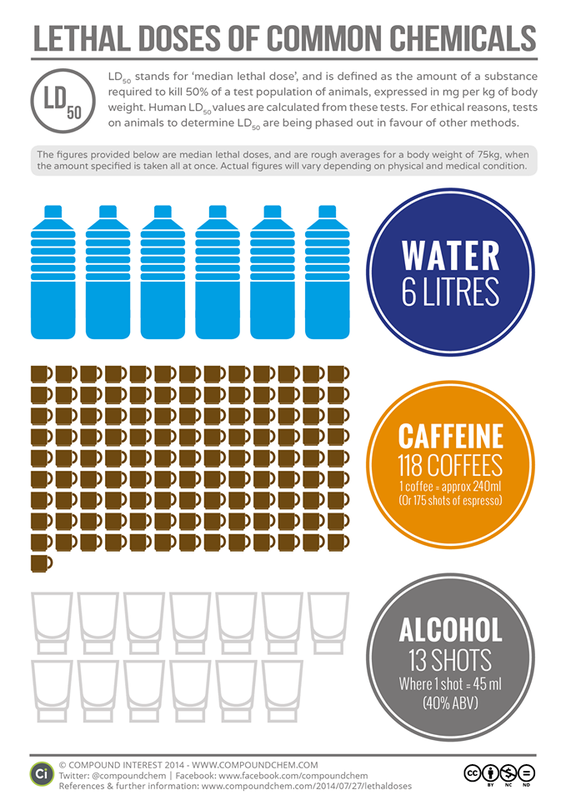 When you consume any food or beverage, keep in mind its LD50, and drink responsibly.